Get the best of rental deals for Cardiff Airport with us, at most competitive prices. We work with leading suppliers in and around Cardiff to present travelers with best deals, exclusive discounts, top collection of cars ad much more. With easy rental booking engine which allows 3 step booking, we aim to make car rental hassle free. Just select your location, book your deal and get the printout of your rental confirmation voucher. We present variety of rental inclusions including collision damage waiver, vehicle theft waiver, third party insurance, road fund tax, VAT, airport fee and other local taxes. Find suitable rental cars from our wide fleet of cars including economical and high end segments from top brands. 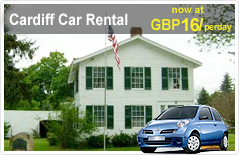 We also present car hire for other key pick up locations in and around Cardiff city. Rent a car at Cardiff airport now and plan your stay accordingly.